From the beginning, my philosophy has been to breed quality. This may sound like a cliche, but it is much easier said than done. Breeding quality takes relentless effort and an incredible amount of time to assure that the odds are stacked in favor of your unborn cria. We invite you to visit our farm and see the results for yourself. 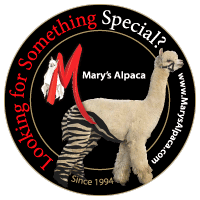 Located in The Plains, Virginia, Mary’s Alpaca is beautifully situated on rolling acres of pastureland, mountains with views galore and a mere 45 minutes from Washington, DC. Recognizing the goal of producing the healthiest livestock necessary to enhance the American fiber industry, we are dedicated to producing elite Huacaya fiber in all colors. We are establishing our own recognizable fleece and alpaca style and we will make our finest bloodstock available. I was fortunate to own the renowned Accoyo herdsires Caligula, Endurance, Justinian and Eagle who have profoundly influenced our breeding program and indeed much of the fine herds of our country. Our show ring success has numerous Get of Sire, Breeder’s Best Three and Championship purples under our show belt and for 5 years had the privilege of claiming one of the “Small Breeder of the Year” awards. Our newest crop of cria are amazing both in their conformation and quality of fiber. It was my computer/developer husband, Harvey, who suggested that I bring my growing family of alpacas together on the Internet. When your team, city, horse, or child reaches the World Series, Super Bowl, Kentucky Derby, or Miss America Pageant, almost nothing can still your excitement. It is the showdown, the big moments, the point towards which careers have been aimed, often for months and years. For people who participate in these annual events, it is often an "experience of a lifetime." For alpaca breeders and enthusiasts, the All American Alpaca futurity is such an event. It is that climactic moment when you find out if your tireless efforts at selection, acquisition, and breeding will be rewarded by your peers. It’s the moment you discover whether or not you have been doing things right – or "right enough" – and if your enthusiasm for your animals is realistic, or overly optimistic. It is truly the moment of truth in the alpaca world. No small part of the interest and enthusiasm this annual event generates is attributed to the more than $250,000 in prize money which is awarded during the Futurity. The large prize awards are yet another measure of the success and growth of alpaca breeding in this country. As a small breeder who started in 1993, attending the 1999 All American Alpaca Futurity was like the farm girl traveling to the big city… everything was impressive. It is a nearly endless visual feast of the finest alpacas in the country. The growing representation of "color" was especially interesting, and it was obvious that the trend toward breeding for color has gained momentum. Some of the variations on color, I had never seen before. Still, I can’t imagine anything quite as beautiful as lustrously soft, white fleece, which will most likely always be the industry staple. The much-heralded Small Breeder Award was given additional interest with a special $15,000 prize. This prize was available only to breeders who owned limited numbers of females. For the large "less is more," and "quality, not quantity" crowd, the $15,000 was a real inspiration. Because our industry is relatively new and still quite small when compared to other agricultural interests, there is a ravenous appetite for alpaca information. And nowhere will you find more alpaca information than at the annual Futurity. Each owner is a fountain of free-flowing information and experience, and we were all tireless in engaging each other to benefit from the collective experience of trial and error. There were some breeding buzz words – new to my ears – being bantered about, like "heterozygous," "out crossing," and "line breeding," to name a few. By engaging in these comparative conversations, I came to discover that my little alpaca ranching operation is considerably different from the norm, even downright unique! Where others merely open the back door to check on their alpacas, I have to boot-up my computer. Most can see their animals through the kitchen window, but I have to see them on a computer screen. 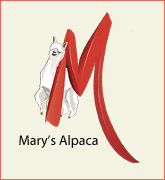 Almost everyone’s alpacas are on a farm or ranch, but mine are on a website at www.marysalpaca.com. My solution for growing an alpaca business while living in Miami, Florida was to place my animals with carefully chosen alpaca breeders around the country. This way I could assure my animals the best care (and freedom from Miami’s heat and humidity) and a well-suited climate. It was my computer-developer husband, Harvey, who suggested that I bring my growing family of alpacas together on the Internet. You can visit my alpacas at any time of the night or day by surfing over to my website. Each female is linked to pictures of her cria as well as pictures (in most cases) of her sire and dam. My studs are also linked to pictures of their cria as well as their sires and dams. Any animals that are available for sale are listed on my special "Sales Page." I’ve sold animals directly off my website. I’m looking into putting in streaming video so a potential buyer will be able to see for himself, on the Internet, how the animal moves and acts. The nice thing about my Internet alpaca ranch is I won’t ever run out of room. Harvey assures me the Internet is big enough to house any number of alpacas I am ever likely to own. I hope he is right, because I am expanding my herd. I had a fortunate beginning, in that the first animals I purchased were all exceptional. I took the time to educate myself at 2 judges clinics, given by Jody Robinson and Susan Tellez, which gave me a better idea of which animals to select for my breeding program and to be able to make a qualified selection of whom to enter in the show ring. Considering the fact that I was in the unfortunate position of not living with my animals, I was inclined toward the goal of showring success. The recognition that comes from your peers and judges like Maggie Krieger, Dr. Sumar and Jody Robinson, gives a lot of credibility to the quality of my animals. My first alpaca was a vicuña-colored Peruvian, Carinosa, whom I bred to a stunning male, Accoyo Caligula. I also had the good fortune of meeting Don Julio Barreda (owner of the Accoyo Estancia herd in Peru). He says it was only by accident that Accoyo Caligula got away from him by jumping a fence into the selection group being exported to the states. I have since purchased a half-interest in 14-year-old Accoyo Caligula and now own him with Greg Mecklem and Diana Yates of Pacific Crest Alpacas in Oregon, where he is standing at stud and siring some of the most outstanding cria in the country. From the beginning, my philosophy has been to breed quality. This may sound like a cliché, but it is much easier said than done. Breeding quality takes relentless effort and an incredible amount of time to assure that the odds are stacked in favor of your unborn cria. My first breeding produced Champion El Patron, who went on to win five blue ribbons as a two-year-old. Patron has gone on to father several outstanding offspring. He will be available at East Brook Farms in upstate New York. I’m now at the point where I buy and breed some superlative animals. A couple of years ago, I bought Peruvian Accoyo Royal Flush (with co-owner Cathy Crosson) and his half sister, Royal Velvet, both offspring of Royal Fawn. (Royal Flush is now standing at stud at Silver Creek Alpacas in Ohio.) I first saw them, as juveniles, at a show in New Jersey, where he, a fawn-colored Accoyo had taken first and she, second. Both were colored, deliciously soft, and irresistibly perfect. I couldn’t resist. So, if quality breeding is so rigorous and scientific, what am I doing buying on impulse? I’m a woman…it’s allowed! Six years from my uncertain beginning, I found myself awed and intimidated at one of the biggest alpaca events of 1999. The best were here from every part of the continent – alpacas of indescribable beauty and apparent perfection. How could a girl from a small ranch on the Internet compete? Beats me! But ZOWIE! Can you believe it? I actually won the small breeder of the year for huacayas! (Ahem! )… A bit of modesty here. I actually tied with Peter Buckingham. That was 1999. In 2000 I was Reserve Small Breeder. Sue Bailey of Silver Creek was the champ. I keep warning her to watch out in 2001. My breeding program seems to be working. So what can I say? "The judges were incredibly perceptive. Boy did they know their business! Boy did they know where the quality was!" (HA!) So much for wishful thinking. Talk about squeakers. The competition was awesome. I have a brand new stud – a wonderful son of Caligula named Peruvian Accoyo Jedi. He will be standing at stud at Fleecy Dale Alpacas in New Jersey for 2001. With his magnificent, uniform fleece and outstanding architecture, his bloodline could single-handedly improve an entire herd. The next Futurity? You bet I’m going! My studs, El Patron and Caligula, have outstanding cria that I want to show off, and Royal Flush has put a rare "Rag-Mop" fleece on three little ones so far. Of course, there’s this cria called Tinkerbelle by Caligula whose fleece looks like jewelry…And oh, did I mention lovely little Velvet Rose?